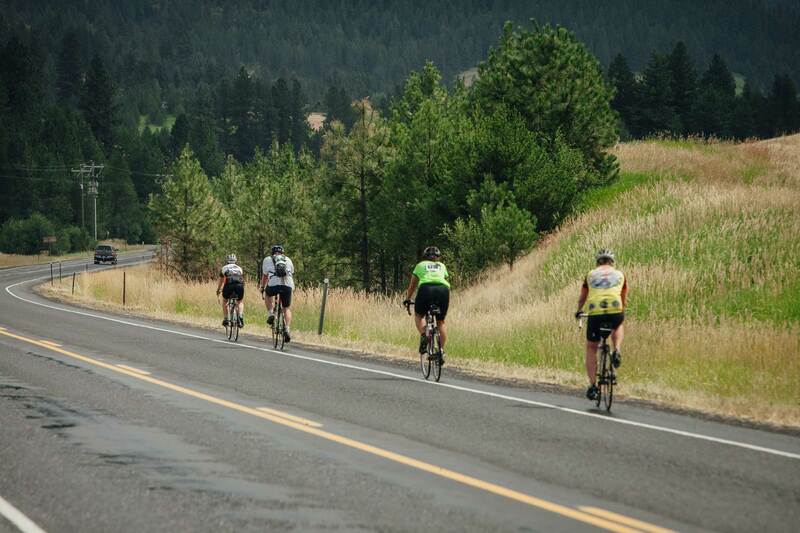 Moscow Fondo – 100 miles – This Fondo provides food, hydration, festivities, and transportation for the rider who wants a seriously awesome 100 mile ride experience that winds through the beautiful Palouse. Riders need to be at least 15 years old or with an adult and everyone needs to have previous riding experience. The riding times for this 100 miler are between 5 and 10 hours. Riders will be pulled from the course at 4:00PM and re-positioned at the Pullman Shuttle / Aid Station 9 to finish or be taken back the the Start line / Nazarene Church parking lot. This course has over 5000 feet of climbing over 100 miles. The Moscow Fondo starts in Moscow at the Nazarene Church on 7th and meets up with the Latah Trail via Blaine Street. The course then travels 13.5 miles east from Moscow to Troy via the Latah Trail. Shuttle / Aid station 1 is at mile 7. From Aid station 1, the course continues to the Troy City Park where the Shuttle Stop / Latah Trail Pancake Feed / Aid 2 station will be. All are invited to participate. The Latah Trail Foundation will be offering side tours from Troy, down Bear Creek Canyon, to the end of the Latah Trail. It is a great opportunity to see the newest extension. The course then continues out 12 miles on Hwy 8 to Shuttle / Aid 3 where riders take the Hwy 9 junction toward Harvard. Turning left on Hwy 9, riders go for 10 miles to Shuttle / Aid 4 at the Hwy 6 junction in Harvard. Turning left again, the next leg of this course follows Hwy 6 into Potlatch where it will pass through the Shuttle / Aid 5 during the Potlatch Days festival at Locomotive Park. From Aid 5, the course follows Hwy 6 / Hwy 95 10 miles to Palouse Aid 6. Riders will turn right and go up the small ill to pick up Hwy 272. From here, the course gets hilly. After 10 miles on Hwy 272 the riders will find Aid 7 just before Colfax. From Aid 7, riders will ride 2 miles to Hwy 195 in Colfax before they turn left and follow Hwy195 east 8 miles to the Albion Cutoff road. The route then goes through Albion to the Pullman / Palouse Hwy where they turn right and head south. Riders follow the Palouse / Pullman Hwy for 1 mile where they will will turn left on to Terreview. The route then goes across on Terreview to the Latah Trail Shuttle / Aid 8 station. The Last leg of the course is along the Chipman Trail to Moscow where it finishes at the Aid Station 9 / Start line / Nazarene Church parking lot. There will only be a shuttle bus option on the first half of the course between Moscow, Troy, Potlatch, and Pullman. it will run roughly every 30 minutes. There will be porta potties at every shuttle stop / aid station. The shuttle stops are at The Nazarene Church in Moscow, NRS East Parking lot in Moscow, Troy City Park in Troy, Hwy 9 junction, Hwy 6 junction, Locomotive Park in Potlatch, and the Pullman Aid Station at the Terreview street intersection. The shuttle lap takes about 1 hour.